It was 6:15 a.m., and the sun was barely over the horizon. I was headed to the lost-and-found booth and there wasn't another person in sight; nobody else, that is, until I rounded the end of a wall and met a 30-ish woman. She stood about five-six with dark brown shoulder-length hair, dark eyes, a toothy smile and had absolutely nothing on. Nothing. "You lose something?" she asked. "As a matter of fact, yes" I answered and then added--and not until this very moment thinking how creepy this next part might have been interpreted--"my daughter." It's true. I had lost my daughter Ria. RIA-UNITED: Spoiler alert. We found each other. I am writing this from a folding beach chair on Thursday afternoon. It's day four of an annual weeklong cultural and arts event held in Nevada's Black Rock Desert called Burning Man. 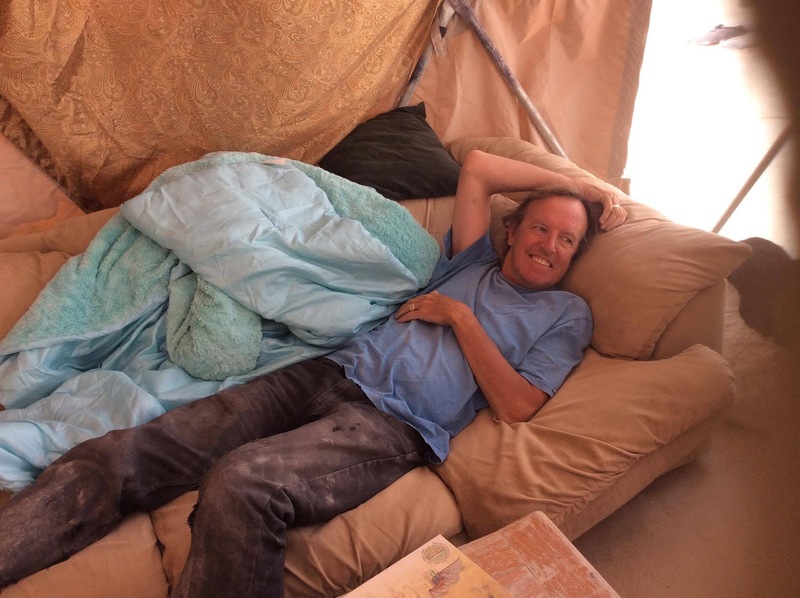 If you're not familiar with Burning Man, google it after you read my blog. 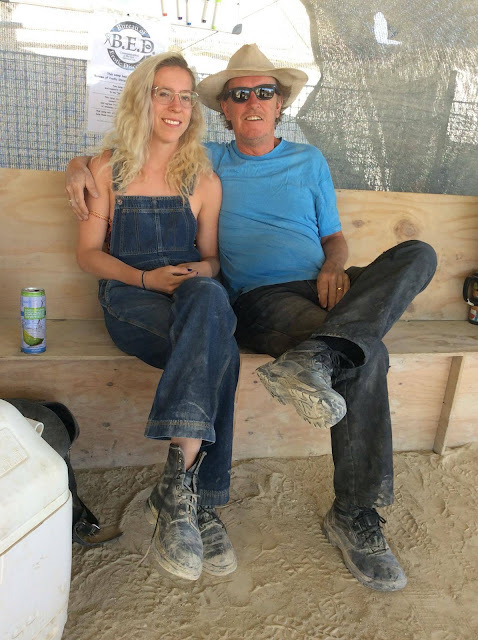 There're lots of better pictures on the web than I could ever take and it's hard to describe, but fact is, if the sight of men and women in various states of dress, down to and including bare nakedness, offends you, ya might not like Burning Man. My twin daughters Ewa and Ria attended a few years ago and this year, Ria--with her sister's full support--bought me and her flights to Reno and tickets to Burning Man. Notice I said flights to Reno? It's a good two hours south of here. The plan was to cadge rides from the Reno airport with other Burning Man attendees, or "burners." is one of "radical self-reliance" but also leaving absolutely no trace of having been on the desert for a week. What you bring in, you take out with you. Hence the loaded-down vehicles. And hence the availability of rides from the airport. So Ria and I did indeed get rides. In separate cars. Sunday evening. And what day was I at the lost-and-found? That's right. Monday. I got a lift in a half-ton camper with a California couple, Daryll and Bee, Burning Man veterans who schooled me on etiquette and warned me about how desert dust finds its way into every nook, cranny, and other places the sun's rays never alight. had previously managed to have reserved for us. Even though Burning Man is a temporary community, it is gridded off like a well-planned city. We were to meet at site 6:15-A. Whichever of us arrived first would start setting up camp and wait for the other. Did I mention there are thousands of campsites? And that it was night? And even though Daryll knew the grid and agreed to drive me right to our site, when we got near we realized that you couldn't drive a vehicle into what I thought was the 6:15-A area. Daryll took me as close as possible and dropped me-- along with my 13 kg backpack with a sleeping bag bungee-corded to it plus four gallons of drinking water in two separate jugs and of course no cell phone or means of contacting Ria wherever she was--off. In the dark. Smack in the middle of a city of campsites, RVs, tents and thousands of strangers. And for reasons I won't go into here except to say you'd think a guy my age would at least consider an occasional plan-b, and of course I hadn't, I got lost. In the dark. In a jungle of tents, invisible guy wires, dead ends. Finally, at one point, after at least an hour of my impossible trek, I stopped at a campsite and asked the woman--she looked about Ria's age-- for advice. Or help. Her first response? "Mister, you need a drink." And then, "We have a couch, right there, that you can use til you resume your search in the daylight." Confident that Ria was likely somewhere on the Burning Man site, and feeling in my muscles every inch of the trip that had started back at my house in Toronto earlier in the day, I accepted the offer. I suprised myself by sleeping. Til dawn. I left all my stuff beside the couch and headed down to the Burning Man public message centre. I'd tripped across it during the night but it was closed. The message centre is also right beside the lost and found booth, which is where I ran into the woman back there in the first paragraph. I told her about losing Ria. And joked that describing my daughter -- a tall slender 25-year-old blonde woman--described about 10,000 other burners. The naked lady's response? "You need a hug!" Which, to my suprise, she delivered. Then as she walked away, she glanced back and said "If I were you, I'd get myself another 25 year old." P.S. Ria and I found each other about an hour later. And I could be wrong but I haven't seen the lost-and-found girl again, I'm pretty sure. So what happens in Vegas, stays in Vegas; but what happens or what you bring to Burning Man doesn't. It comes back to haunt the rest of us.